Attractive Gift Box is covered in fun smile graphic - a sunny way to brighten anyone's day! Wide Variety: 20 individually wrapped snacks and candy treats. 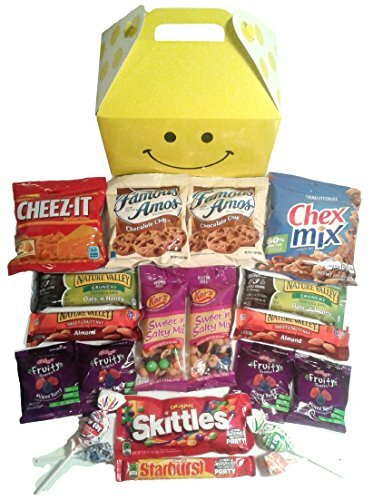 Box includes: cookies, candy, granola, chex mix, crackers, lollipops, and fruit chews. Great for graduation, summer camp, Father's Day, student care package, military care package, co-workers, birthday, thank you, Valentines.. Select as a GIFT at checkout to include a gift message! If you have any questions about this product by snackhappy, contact us by completing and submitting the form below. If you are looking for a specif part number, please include it with your message.